Cairt o Iran unner the Qajar dynasty in the 19t century. 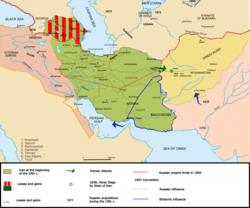 The Qajar dynasty ( listen (help·info); Persie: سلسله قاجار‎ Selsele-ye Qājār; an aa romanised as Ghajar, Kadjar, Qachar etc. ; Azerbaijani: Qacarlar) wis a Persianised ryal faimily o Turkic origin, which ruled Persie (Iran) frae 1785 tae 1925. ↑ "Genealogy and History of Qajar (Kadjar) Rulers and Heads of the Imperial Kadjar House". ↑ Dr Parviz Kambin, A History of the Iranian Plateau: Rise and Fall of an Empire, Universe, 2011, p.36, online edition. ↑ Jamie Stokes, Anthony Gorman, Encyclopedia of the Peoples of Africa and the Middle East, 2010, p.707, Online Edition, The Safavid and Qajar dynasties, rulers in Iran from 1501 to 1722 and from 1795 to 1925 respectively, were Turkic in origin. ↑ Abbas Amanat, The Pivot of the Universe: Nasir Al-Din Shah Qajar and the Iranian Monarchy, 1831–1896, I.B.Tauris, pp 2–3; "In the 126 years between the fall of the Safavid state in 1722 and the accession of Nasir al-Din Shah, the Qajars evolved from a shepherd-warrior tribe with strongholds in northern Iran into a Persian dynasty.."
↑ Choueiri, Youssef M., A companion to the history of the Middle East, (Blackwell Ltd., 2005), 231,516.